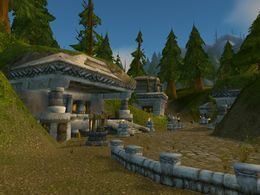 萨尔玛（Thelsamar） is a dwarven town on the west side of Loch Modan, located north of Grizzlepaw Ridge and northeast of Stonesplinter Valley. The town has a Gryphon roost, an inn, and several vendors and profession trainers. A north-south road runs just west of town, leading to the passes into Dun Morogh and the Wetlands. Inside the Explorers' League house and Magistrate Bluntnose's house on the top floor behind all the boxes is a metal hand much like the one in the Terminator movies.